Gardeners are used to dirt and dust, accustomed to having it all over hands, under fingernails, and covering clothing. There's nothing wrong with that, in fact, it's probably downright healthy. However, having to constantly clean it up can be irritating and time-consuming especially when we'd rather spend that time doing things outside in our gardens. One of the tricks, I've learned over the years is that it is much easier to keep the house cleaner if I keep the dirt outside. 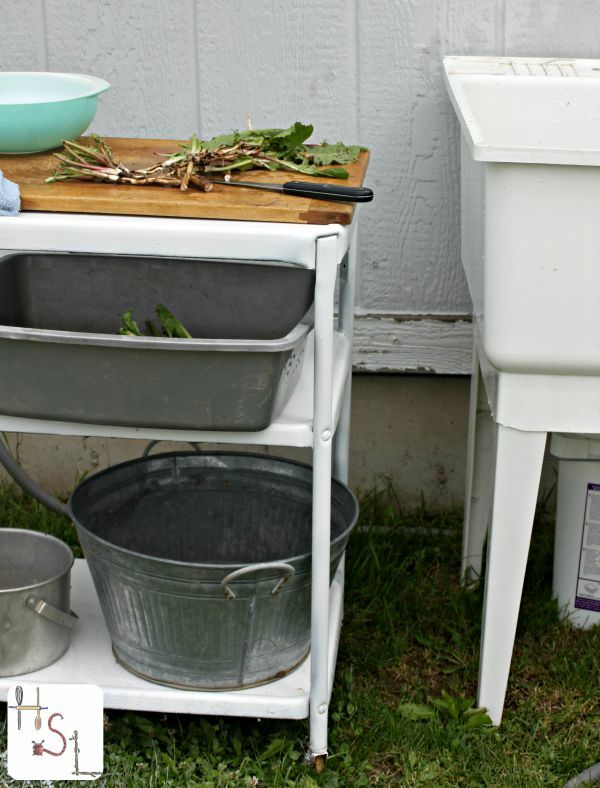 Having an outdoor prep area means that all the dirt covering root vegetables or the excess of cabbage root balls and other items headed for the compost bin simply never enters the house. As much as I love the gorgeous outdoor kitchen set-ups I see in glossy magazines and all over Pinterest, I don't have the budget or inclination, frankly, for that. 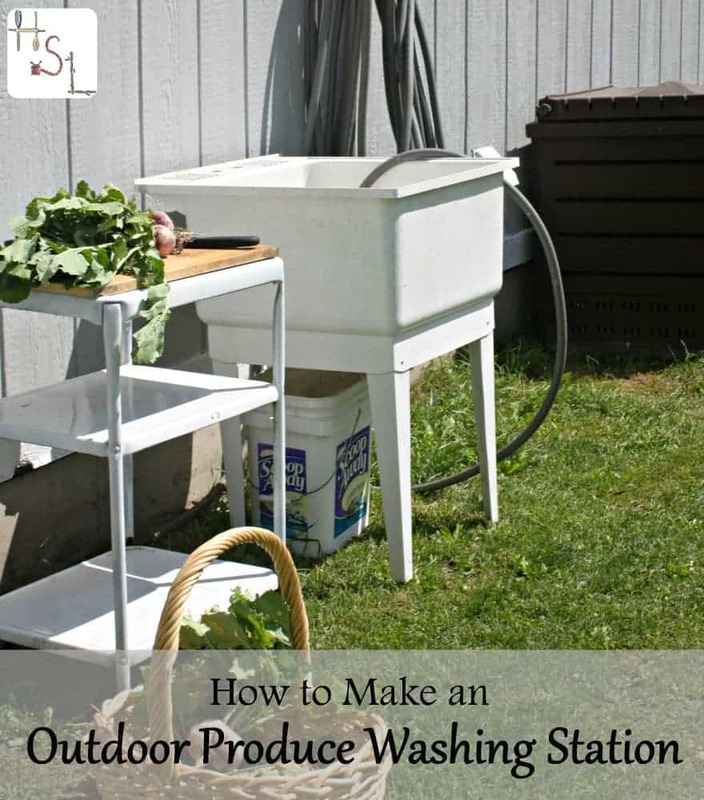 I do, however; have enough of a frugal and functional sensibility to piece things together for a more than workable outdoor produce washing station. Water supply is important here. I set my little area up right next to a hose bib and use a hose as my faucet. No need to have something special plumbed in. A sink is obviously a nice thing. 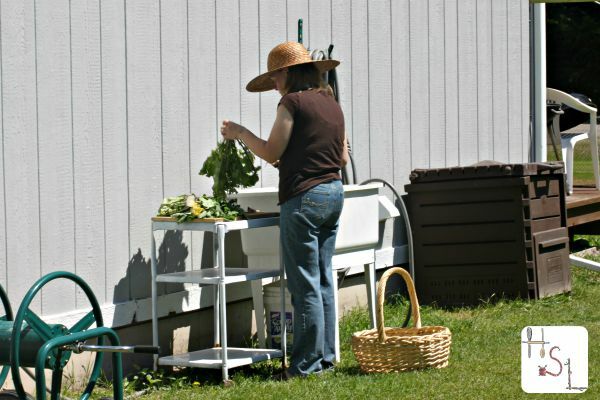 It's fine to wash things in tubs or buckets on the ground, but being able to stand up makes everything less of a chore on a gardener's body. Look for something second hand if at all possible. I found this laundry sink second hand at my local Habitat for Humanity Resale Store. It was $25 and it works great. I had seen some lovely double metal sinks at a local antique shop but it was way outside my budget. I've seen other folks build pedestals for kitchen sinks too. Let your skill level and inclination be your guide. Be prepared for drainage. If the sink, isn't plumbed into the home's pipes / sewage system then a collection system is a wise move. I simply put a bucket under the drain and pour the waste water back onto the gardens. It's easy and a great way to recycle waste water. As you're prepping garden produce to go in the house and perhaps for some kind of preservation, it's easiest to keep this outside too. A table or some kind of workspace comes in handy. Again, look second hand for some kind of table. This little beverage cart was found at a yard sale for a $1. It was a quite rusty but a little sanding and some paint made it perfect. I have a wood cutting board that sits by the side door and sits on the top shelf when I'm working – I don't leave it out here all year long. We put a compost bin right next to our prep area, this way all the stuff we don't want (carrot tops, cabbage root balls, etc.) can be tossed right away without any extra trips to other compost bins back in the garden. It's a small thing but when dealing with a lot of things at once, keeping it all streamlined and efficient helps maximize time and minimize exhaustion (at least a little). Now that everything is clean, take it inside and eat or preserve and know that the kitchen will be at the very least freer of garden soil because you left it all outside. What's your favorite way to make the garden harvest easier? I seriously need to do this! We even have a sink, a regular indoor sink so I’m waiting on hubby to build me a stand. I love your set up! Love seeing those dandelion roots on your cutting board. I’ve been thinking about doing this forever. Seeing yours is motivating me to get it done!